I like to avoid fried food, but thought I would take one for the team to try these zucchini flowers. However, the first recipe for stuffed zucchini flowers that I found when flicking through my cookbooks was not fried at all. In Jamie Does, Jamie Oliver features a recipe for stuffed zucchini flowers in tomato sauce - perfect! It meant that I could cook my zucchini flowers without feeling bad about deep frying. One thing I hadn't really considered was how fiddly it is to prepare and stuff the zucchini flowers. I made it more difficult for myself by refrigerating the flowers so that the petals wilted and stuck together (tip - do not do this). You have to open up the petals carefully and somehow get into the flower cavity and snip out the stamen. Next, you have to coax a ricotta and herb cheese mix into the tiny flower cavity without tearing the flower - sheesh. It is not a job to do when you are short on time. 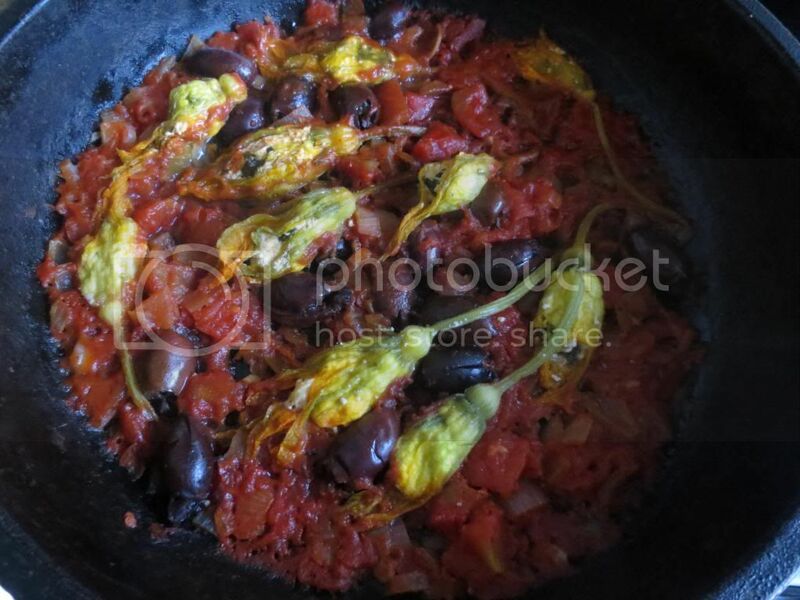 Despite the fiddliness of it all, I managed to successfully stuff my 14 zucchini flowers, and make the dish with tomatoes and olives. It was really delicious, although I think the strong flavours of the tomatoes and olives overwhelmed most of the other flavours. Pick the leaves off the herbs, and finely chop the leaves and the stalks. Place in a bowl with the ricotta, parmesan, nutmeg and salt and pepper to taste, then add the finely grated lemon zest. Mix well with a fork. Prise open the zucchini flowers, and snip off the bright yellow stamens. Rinse the flowers and carefully fill each one with a teaspoon (or however much you can fit in!) of the ricotta mixture. Carefully press and pat the petals back together to seal in the mixture. Cut a small cross in the top and bottom of your tomatoes, then plunge them into a bowl of boiling water for a minute or so until the skins blister and come away. Place in cold water until cool enough to handle, then peel off and discard the skins. Cut the flesh into 1cm chunks. (Or just open a tin of tomatoes!) In a wide pan, heat a good lug of olive oil on medium heat and fry the garlic and shallots for 3 to 4 minutes until soft. Add the tomatoes and olives and bring to the boil then season with salt and pepper. Simmer on medium heat for 5 minutes, until thickened slightly. When your sauce is ready, carefully lay your stuffed flowers on top and drizzle with olive oil. Cover the pan and leave on a low heat to simmer for 15-20 minutes, until the zucchini flowers are cooked through and the sauce is thick. Cut the zested lemon in half, and squeeze the juice of one half onto the sauce. Serve with lemon wedges, salad and bread, if desired. The only time I've eaten zucchini blossoms was decades ago in Tuscany. I've always wanted to find some, too, and try my hand at a recipe. These look wonderful...lucky you! I've never had zucchini flowers either but have wanted to try them for a while. Your dish looks delicious! Wish we got these delicious flower here. I've never heard of cooking with zucchini flowers. Great dish! Great idea making a non deep fried version! We always see it on menus deep fried!